The Pinsk Jewry in 1555. Russian city in the government of Minsk, Russia. There were Jews in Pinsk prior to the sixteenth century, and there may have been an organized community there at the time of the expulsion of the Jews from Lithuania in 1495; but the first mention of the Jewish community there in Russian-Lithuanian documents dates back to 1506. On Aug. 9 of that year the owner of Pinsk, Prince Feodor Ivanovich Yaroslavich, in his own name and in that of his wife, Princess Yelena, granted to the Jewish community of Pinsk, at the request of Yesko Meycrovich, Pesakh Yesofovich, and Abram Ryzhkevich, and of other Jews of Pinsk, two parcels of land for a house of prayer and a cemetery, and confirmed all the rights and privileges given to the Jews of Lithuania by King Alexander Jagellon. This grant to the Jews of Pinsk was confirmed by Queen Bona on Aug. 18, 1533. From 1506 until the end of the sixteenth century the Jews are frequently mentioned in various documents. In 1514 they were included in the confirmation of privileges granted to the Jews of Lithuania by King Sigismund, whereby they were freed from special military duties and taxes and placed on an equality, in these respects, with the other inhabitants of the land, while they were also exempted from direct military service. They were included among the Jewish communities of Lithuania upon which a tax of 1,000 kop groschen was imposed by the king in 1529, the entire sum to be subject to a pro rata contribution determined upon by the communities. From other documents it is evident that members of the local Jewish community were prominent as traders in the market-place, also as landowners, leaseholders, and farmers of taxes. In a document of March 27, 1522, reference is made to the fact that Lezer Markovich and Avram Volchkovich owned stores in the market-place near the castle. In another document, dated 1533, Avram Markovich was awarded by the city court the possession of the estate of Boyar Fedka Volodkevich, who had mortgaged it to Avram's father, Mark Yeskovich. Still other documents show that in 1540 Aaron Ilich Khoroshenki of Grodno inherited some property in Pinsk, and that in 1542 Queen Bona confirmed the Jews Kherson and Nahum Abramovich in the possession of the estate, in the village of Krainovichi, waywodeship of Pinsk, which they had inherited from their father, Abram Ryzhkevich. Abram Ryzhkevich was a prominent member of the Jewish community at the beginning of the sixteenth century, and was active in communal work. He was a favorite of Prince Feodor Yaroslavich, who presented him with the estate in question with all its dependencies and serfs. The last-named wererelieved from the payment of any crown taxes, and were to serve Abram Ryzhkevich exclusively. He and his children were regarded as boyars, and shared the privileges and duties of that class. Pesakḥ Yesofovich, mentioned with Yesko Meyerovich and Abram Ryzhkevich in the grant to the Jewish community of 1506, took an important part in local affairs. Like Abram Ryzhkevich, he was intimate with Prince Feodor Yaroslavich, was presented by the prince with a mansion in the town of Pinsk, and was exempted at the same time from the payment of any taxes or the rendering of local services, with the exception of participation in the repairing of the city walls. The possession of this mansion was confirmed by Queen Bona to Pesakḥ's son Nahum in 1550, he having purchased it from Bentz Misevich, to whom the property was sold by Nahum's father. Inheriting their father's influence, Nahum and his brother Israel played important rôles as merchants and leaseholders. Thus on June 23, 1550, they, together with Goshka Moshkevich, were awarded by Queen Bona the lease of the customs and inns of Pinsk, Kletzk, and Gorodetzk for a term of three years, and had the lease renewed in 1553 for a further term of three years, on payment of 875 kop groschen and of 25 stones of wax. In the same year these leaseholders are mentioned in a characteristic lawsuit. There was an old custom, known as "kanuny," on the strength of which the archbishop was entitled to brew mead and beer six times annually without payment of taxes. The Pesakhovich family evidently refused to recognize the validity of this privilege and endeavored to collect the taxes. The case was carried to the courts, but the bishop being unable to show any documents in support of his claim, and admitting that it was merely based on custom, the queen decided that the legal validity of the custom should not be recognized; but since the income of the "kanuny" was collected for the benefit of the Church the tax-farmers were required to give annually to the archbishop 9 stones of wax for candles," not as a tax, but merely as a mark of our kindly intention toward God's churches." The Pesakhovich family continues to be mentioned prominently in a large number of documents, some of them dated in the late sixties of the sixteenth century. Thus in a document of May 19, 1555, Nahum Pesakhovich, as representative of all the Jews in the grand duchy of Lithuania, lodged a complaint with the king against the magistrate and burghers of Kiev because, contrary to the old-established custom, they had prohibited the Jews from coming to Kiev for trading in the city stores, and compelled them to stop at, and to sell their wares in, the city market recently erected by the burghers. Postponing his final decision until his return to Poland, the king granted the Jews the right to carry on trade as theretofore. In a document of Oct. 31, 1558, it is stated that the customs, inns, breweries, and ferries of Pinsk, which had been leased to Nahum and Israel Pesakhovich for 450 kop groschen, were now awarded to Khaim Rubinovich for the annual sum of 550 groschen. This indicates that the Pesakhovich family was yielding to the competition of younger men. An interesting light is shed on contemporary conditions by a document dated Dec. 12, 1561. This contains the complaint of Nahum Pesakhovich against Grigori Grichin, the estate-owner in the district of Pinsk, who had mortgaged to him, to secure a debt of 33 kop groschen and of 5 pails of unfermented mead, six of his men in the village of Poryechye, but had given him only five men. The men thus mortgaged to Nahum Pesakhovich were each compelled to pay annually to the latter 20 groschen, one barrel of oats, and a load of hay; they served him one day in every seven, and assisted him at harvest-time. This would indicate that the Jews, like the boyars, commanded the services of the serfs, and could hold them under mortgage. In another document, dated 1565, Nahum Pesakhovich informed the authorities that he had lost in the house of the burgher Kimich 10 kop groschen and a case containing his seal with his coat of arms. In 1551 Pinsk is mentioned among the communities whose Jews were freed from the payment of the special tax called "serebschizna." In 1552-55 the starost of Pinsk took a census of the district in order to ascertain the value of property which was held in the district of Queen Bona. In the data thus secured the Jewish house-owners in Pinsk and the Jewish landowners in its vicinity are mentioned. It appears from this census that Jews owned property and lived on the following streets: Dymiskovskaya (along the river), Stephanovskaya ulitza (beyond the Troitzki bridge), Velikaya ulitza from the Spasskiya gates, Kovalskaya, Grodetz, and Zhidovskaya ulitzi, and the street near the Spass Church. The largest and most prominent Jewish property-owners in Pinsk and vicinity were the members of the Pesakhovich family—Nahum, Mariana, Israel, Kusko, Rakhval (probably Jerahmeel), Mosko, and Lezer Nahumovich; other prominent property-owners were Ilia Moiseyevich, Nosko Moiseyevich, Abram Markovich, and Lezer Markovich. The synagogue and the house of the cantor were situated in the Zhidovskaya ulitza. Jewish settlements near the village of Kustzich are mentioned. A number of documents dated 1561 refer in various connections to the Jews of Pinsk. Thus one of March 10, 1561, contains a complaint of Pan Andrei Okhrenski, representative of Prince Nikolai Radziwill, and of the Jew Mikhel against Matvei Voitekhovich, estate-owner in the district of Pinsk; the last-named had sent a number of his men to the potash-works belonging to Prince Radziwill and managed by the Jew above-mentioned. These men attacked the works, damaging the premises, driving off the laborers, and committing many thefts. By a decree promulgated May 2, 1561, King Sigismund August appointed Stanislav Dovorino as superior judge of Pinsk and Kobrin, and placed all the Jews of Pinsk and of the neighboring villages under his jurisdiction, and their associates were ordered to turn over the magazines and stores to the magistrate and burghers of Pinsk. 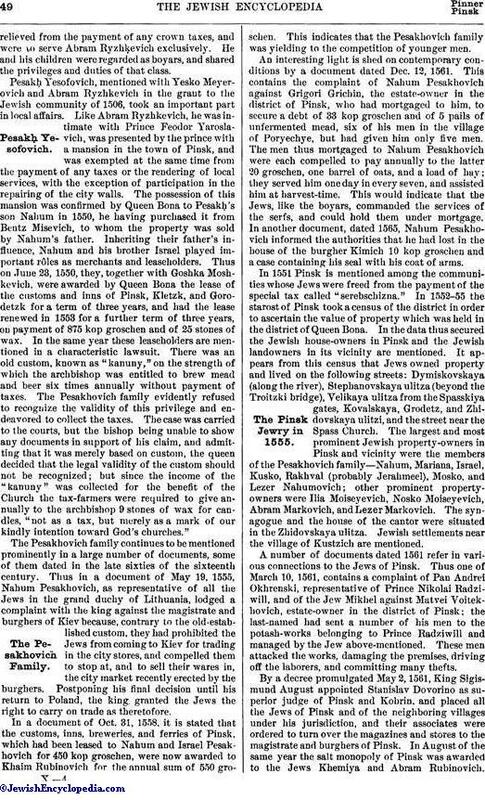 In August of the same year the salt monopoly of Pinsk was awarded to the Jews Khemiya and Abram Rubinovich.But on Dec. 25, 1564, the leases were awarded to the Jews Vaska Medenchich and Gershon Avramovich, who offered the king 20 kop groschen more than was paid by the Christian merchants. In the following year the income of Pinsk was leased to the Jew David Shmerlevich. In the census of Pinsk taken again in 1566, Jewish house-owners are found on streets not mentioned in the previous census; among these were the Stara, Lyshkovska, and Sochivchinskaya ulitzy. Among the house-owners not previously mentioned were Zelman, doctor ("doctor," meaning "rabbi" or "dayyan"), Meïr Moiseyevia, doctor, Novach, doctor, and others. The Pesakhovich family was still prominent among the landowners. In a circular letter of 1578 King Stephen Bathori informed the Jews of the town and district of Pinsk that because of their failure to pay their taxes in gold, and because of their indebtedness, he would send to them the nobleman Mikolai Kindei with instructions to collect the sum due. By an order of Jan. 20, 1581, King Stephen Bathori granted the Magdeburg Rights to the city of Pinsk. This provided that Jews who had recently acquired houses in the town were to pay the same taxes as the Christian householders. Thenceforward, however, the Jews were forbidden, under penalty of confiscation, to buy houses or to acquire them in any other way. Elsewhere in the same document the citizens of Pinsk are given permission to build a town hall in the market-place, and for this purpose the Jewish shops were to be torn down. The grant of the Magdeburg Rights was subsequently confirmed by Sigismund III. (1589-1623), Ladislaus IV. (1633), and John Casimir (1650). In spite of the growing competition of the Christian merchants, the Jews must have carried on a considerable import and export trade, as is shown by the custom-house records of Brest-Litovsk. Among those who exported goods from Pinsk to Lublin in 1583 Levko Bendetovich is mentioned (wax and skins), and among the importers was one Ḥayyim Itzkhakovich (steel, cloth, iron, scythes, prunes, onion-seed, and girdles). Abraham Zroilevich imported caps, Hungarian knives, velvet girdles, linen from Glogau, nuts, prunes, lead, nails, needles, pins, and ribbons. Abraham Meyerovich imported wine. Other importers were Abram Yaknovich, Yatzko Nosanovich, Yakub Aronovich, and Hilel and Rubin Lazarevich. About 1620 the Lithuanian Council was organized, of which Pinsk, with Brest-Litovsk and Grodno, became a part. In 1640 the Jews Jacob Rabinovich and Mordecai-Shmoilo Izavelevich applied in their own name, and in the names of all the Jews then living on church lands, to Pakhomi Oranski, the Bishop of Pinsk and Turov, for permission to remit all taxes directly to him instead of to the parish priests. Complying with this request, the bishop reaffirmed the rights previously granted to the Jews; they were at liberty to build houses on their lots, to rent them to newly arrived people, to build inns, breweries, etc. Toward the middle of the seventeenth century the Jews of Pinsk began to feel more and more the animosity of their Christian neighbors; and this was true also of other Jewish communities. In 1647 "Lady" Deborah Lezerova and her son "Sir" Yakub Lezerovich complained to the magistrates that their grain and hay had been set on fire by peasants. In the following year numerous complaints of attack, robbery, plunder, and arson were reported by the local Jews. Rebellion was in the air, and with the other Jewish communities in Lithuania that of Pinsk felt the cruelties of the advancing Cossacks, who killed in great numbers the poorer Jews who were not able to escape. Prince Radziwill, who hastened to the relief of the city, finding the rioters there, set it on fire and destroyed it. Hannover, in "Yewen Meẓulah," relates that the Jews who remained in Pinsk and those who were found on the roads or in the suburbs of that city were all killed by the Cossacks. He remarks also that when Radziwill set fire to the town, many of the Cossacks endeavored to escape by boats and were drowned in the river, while others were killed or burned by the Lithuanian soldiers. Meïr ben Samuel, in "Zuk ha-'Ittim," says that the Jews of Pinsk were delivered by the townspeople (i.e., the Greek Orthodox) to the Cossacks, who massacred them. Evidently Jews had again appeared in Pinsk by 1651, for the rural judge Dadzibog Markeisch, in his will, reminds his wife of his debt of 300 gulden to the Pinsk Jew Gosher Abramovich, of which he had already repaid 100 gulden and 110 thalers, and asks her to pay the remainder. In 1662 the Jews of Pinsk were relieved by John Casimir of the headtax, which they were unable to pay on account of their impoverished condition. On April 11, 1665, the heirs of the Jew Nathan Lezerovich were awarded by the court their claim against Pana Terletzkaya for 69,209 zlot. For her refusal to allow the collection of the sum as ordered by the court she was expelled from the country. In 1665, after the country had been ruined by the enemy, the Jewish community of Pinsk paid its proportion of special taxation for the benefit of the nobility. 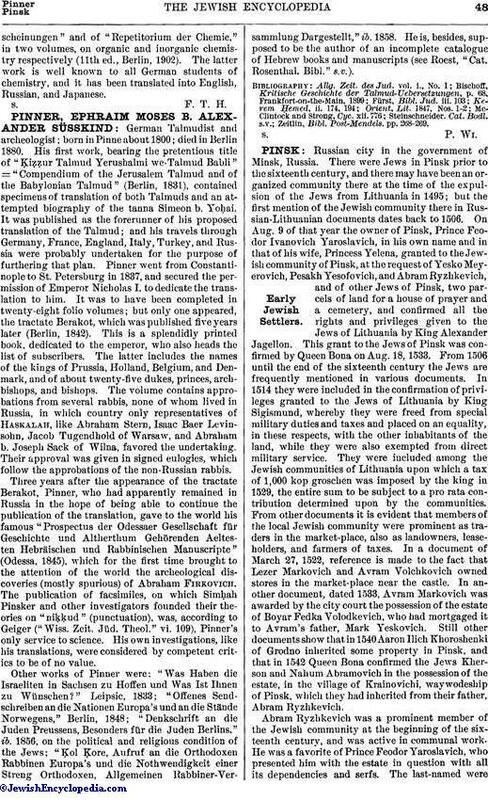 Beyond the fact that Ḥasidism developed in the suburb of Karlin (see Aaron ben Jacob of Karlin), little is known about the history of the Pinsk community in the eighteenth century; but since the first quarter of the nineteenth century the Jews there have taken an active part in the development of the export and import trade, especially with Kiev, Krementchug, and Yekaterinoslav, with which it is connected by a steamship line on the Dnieper. Many of the members of the Jewish community of Pinsk removed to the newly opened South-Russian province and became active members of the various communities there. 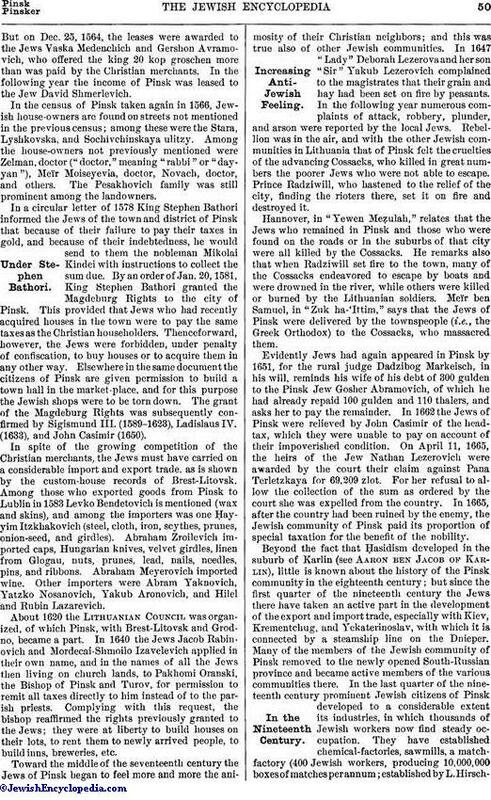 In the last quarter of the nineteenth century prominent Jewish citizens of Pinsk developed to a considerable extent its industries, in which thousands of Jewish workers now find steady occupation. They have established chemical-factories, sawmills, a match-factory (400 Jewish workers, producing 10,000,000 boxes of matches perannum; established by L. Hirschmanin 1900), shoe-nail factory (200 Jewish workers), candle-factory, cork-factory, parquet-factory, brewery, and tobacco-factories (with a total of 800 Jewish workers). The Luries and Levines have been especially active in that direction. Another cork-factory, owned by a Christian, employs 150 Jewish workers; and the shipyards (owned by a Frenchman), in which large steamers and sailing vessels are built, also employs a few hundred Jews. Besides these, there are many Jewish artisans in Pinsk who are occupied as nailsmiths, founders, workers in brass, and tanners; in soap-manufactories, small breweries, violin-string factories, the molasses-factory, the flaxseed-oil factory, and the ṭallit-factory. In all these the Jewish Sabbath and holy days are strictly observed. Many Jewish laborers are employed on the docks of Pinsk and as skilled boatmen. Sawmills 3 to 7 rubles. 1.20 to 2.50 rubles. Match-factories 3 to 5 " 1.20 to 2.50 "
Candle " 3.60 .. " 1.80 "
Shipyards 6 to 18 "
Foundries 6 to 16 "
Since 1890 there have been technical classes connected with the Pinsk Talmud Torah, where the boys learn the trades of locksmiths, carpenters, etc., and technology, natural history, and drawing. The first rabbi mentioned in connection with Pinsk is R. Simson. With R. Solomon Luria (MaHRaSh) and R. Mordecai of Tiktin, he was chosen, in 1568, to adjudicate the controversy relating to the association of Podlasye. His successors were: R. Naphtali, son of R. Isaac Katz (removed to Lublin; d. 1650); R. Moses, son of R. Israel Jacob (c. 1673; his name occurs in the "Sha'are Shamayim"); R. Naphtali, son of R. Isaac Ginsburg (d. 1687); R. Samuel Halpern, son of R. Isaac Halpern (d. 1703; mentioned in "Dibre Ḥakamim," 1691); R. Isaac Meïr, son of R. Jonah Ṭe'omim; R. Samuel, son of R. Naphtali Herz Ginzburg (mentioned in "'Ammude 'Olam," Amsterdam, 1713); R. Asher Ginzburg (mentioned in the preface to "Ga'on Lewi"); R. Israel Isher, son of R. Abraham Mamri (mentioned in Tanna debe Eliyahu, 1747); R. Raphael, son of R. Jekuthiel Süssel (1763 to 1773; d. 1804); R. Abraham, son of R. Solomon (mentioned in the "Netib ha-Yashar"); R. Levy Isaac; R. Abigdor (had a controversy with the Ḥasidim on the question of giving precedence in prayers to "Hodu" over "Baruk she-Amar"; the question was submitted for settlement to Emperor Paul I.: "Voskhod," 1893, i. ); R. Joshua, son of Shalom (Phinehas Michael, "Masseket Nazir," Preface); R. Ḥayyim ha-Kohen Rapoport (resigned in 1825 to go to Jerusalem; d. 1840); Aaron of Pinsk (author of "Tosefot Aharon," Königsberg, 1858; d. 1842); R. Mordecai Sackheim (1843 to his death in 1853); R. Eleazar Moses Hurwitz (1860 to his death in 1895). Among those members of the community of Pinsk who achieved distinction were the following: R. Elijah, son of R. Moses ("Ḳiryah Ne'emanah," p. 125); R. Moses Goldes, grandson of the author of "Tola'at Ya'aḳob"; R. Kalonymus Kalman Ginzburg (president of the community); R. Jonathan ("Dibre Rab Meshallem"); R. Solomon Bachrach, son of R. Samuel Bachrach ("Pinḳas Tiktin"); R. Ḥayyim of Karlin ("'Ir Wilna," p. 31); R. Solomon, son of R. Asher ("Geburath He-Or"); R. Joseph Janower ("Zeker Yehosef," Warsaw, 1860); R. Samuel, son of Moses Levin ("Ba'al Ḳedoshim," p. 210); R. Asher, son of R. Kalonymus Kalman Ginzburg ("Ḳiryah Ne'emanah," p. 185); R. Gad Asher, son of R. Joshua Rokeaḥ ("Anshe Shem," p. 63); R. Joshua Ezekiel (ib. ); R. Ḥayyim Schönfinkel (ib. p. 70); R. Abraham Isaac ("Birkat Rosh"); R. Notel Michael Schönfinkel ("Da'at Ḳedoshim," p. 181); Zeeb, Moses, Issac, and Solomon Wolf, sons of R. Samuel Levin; R. Jacob Simḥah Wolfsohn ("Anshe Shem," p. 40); R. Aaron Luria; R. Samuel Radinkovitz. 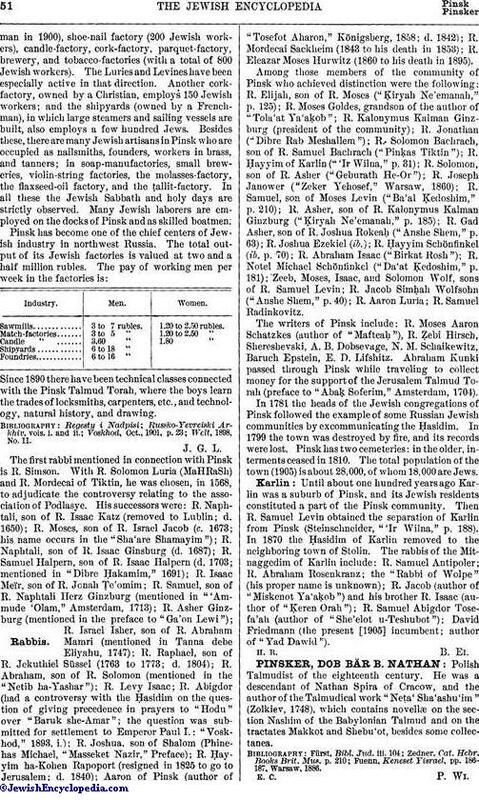 The writers of Pinsk include: R. Moses Aaron Schatzkes (author of "Mafteaḥ"), R. Ẓebi Hirsch, Shereshevski, A. B. Dobsevage, N. M. Schaikewitz, Baruch Epstein, E. D. Lifshitz. Abraham Kunki passed through Pinsk while traveling to collect money for the support of the Jerusalem Talmud Torah (preface to "Abaḳ Soferim," Amsterdam, 1704). In 1781 the heads of the Jewish congregations of Pinsk followed the example of some Russian Jewish communities by excommunicating the Ḥasidim. In 1799 the town was destroyed by fire, and its records were lost. Pinsk has two cemeteries: in the older, interments ceased in 1810. The total population of the town (1905) is about 28,000, of whom 18,000 are Jews. Until about one hundred years ago Karlin was a suburb of Pinsk, and its Jewish residents constituted a part of the Pinsk community. Then R. Samuel Levin obtained the separation of Karlin from Pinsk (Steinschneider, "'Ir Wilna," p. 188). In 1870 the Ḥasidim of Karlin removed to the neighboring town of Stolin. The rabbis of the Mitnaggedim of Karlin include: R. Samuel Antipoler; R. Abraham Rosenkranz; the "Rabbi of Wolpe" (his proper name is unknown); R. Jacob (author of "Miskenot Ya'aḳob") and his brother R. Isaac (author of "Ḳeren Orah"); R. Samuel Abigdor Tosefa'ah (author of "She'elot u-Teshubot"); David Friedmann (the present  incumbent; author of "Yad Dawid").